Promoting safe driving as well as promoting your company brand name is possible this winter - why not give it a try and provide a useful set such as our new Winter Driving Set with Logo. * 1 square branded icescraper - all in a reusable automotive zip top bag. 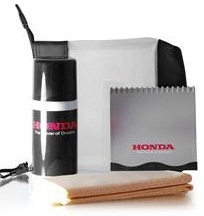 Expose your company this winter as the most perfect business gift or company freebie. For a FREE QUOTE please fill in our contact form regarding our Winter Driving Set with Logo and we'll be able to help you.